Alejandro Velez, Ph.D., Professor of Economics, is passionate about teaching at St. Mary’s and providing students with opportunities to network with professional societies. 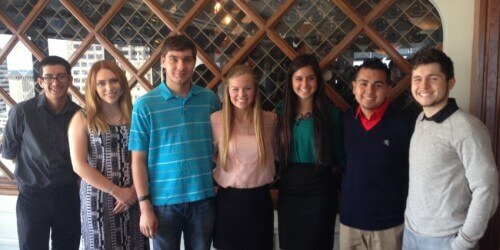 This semester Velez invited his Introductory Microeconomics class to attend a luncheon at the Plaza Club in San Antonio with the San Antonio Business and Economics Society, a professional society. Over 50 people attended the event, 20 of which were Velez’s students. Velez, a board member of the San Antonio Business and Economics Society, understands the importance of professional organizations and the power of networking for students in today’s competitive job market. During the luncheon, students were able to network and had the opportunity to hear Bernard Weinstein, Ph.D., a energy business expert, economist and director of Southern Methodist University’s Maguire Energy Institute, speak at the event.